Back in 1789 a former convict named James Ruse produced the first successful wheat harvest in Australia. He didn’t yield enough grain to make any flour for the colony, but he did produce enough seeds for the next crop, which was also successful. Long before that, Aboriginal and Torres Strait Islander peoples used sophisticated and successful agriculture and aquaculture practices. Today just over half of Australia’s total land area is used for agriculture and we produce far more food than we consume so it’s an important export business for us too. Despite this long history of farming, it can be a tough industry. Our country is fraught with droughts, floods, pests and everything in between. Our farmers are resilient but they’re also the source of much ingenuity in Australia – continually advancing and improving. For example, in 1876 farmers Richard and Clarence Bowyer Smith invented the stump jump plough to solve the problem stumps damaging the undercarriage of ploughs. And in 1912, a 16-year-old farmer’s son, Cliff Howard, invented the self-propelled rotary hoe that pulls itself forward while it hoes the ground. Flash forward and we’re facing the digital revolution. So naturally we’re looking at how digital technologies can be used to help farmers and agriculture businesses to feed millions more people while also being increasingly sustainable. A major initiative we’re working on called Digiscape is using high risk, fast results frontier science to help reinvent and create new industries for Australian agriculture. With that in mind, here are a couple of examples of how we hope Digiscape’s science and technology will help Aussie farmers. We’re combining satellite and in-paddock sensor data to show what’s happening on the land. Using this data coupled with analytics, or science-based predictions, we can help farmers and land managers see what might happen in the future as a result of how they manage their land. 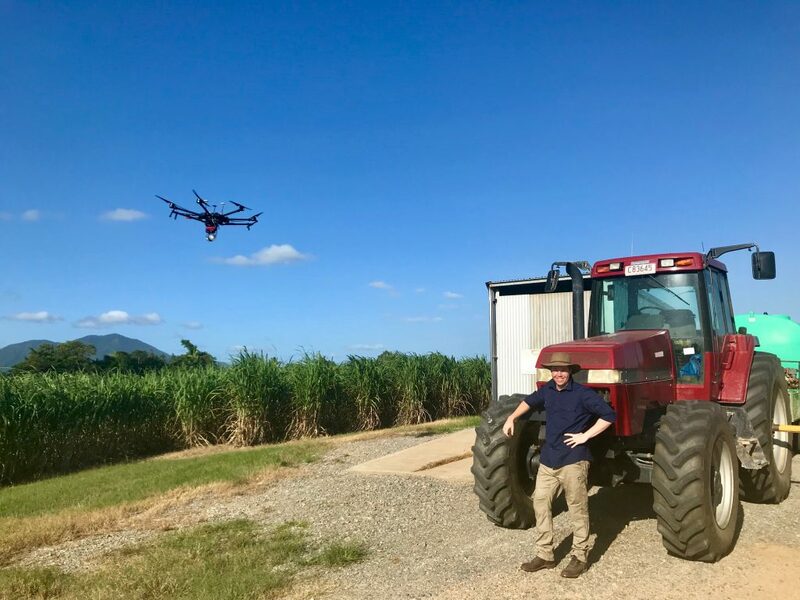 Things like smart irrigation systems, weather and climate forecasts at longer time scales and smaller spatial scales, and helping reduce fertiliser runoff from sugar cane farms near the Great Barrier Reef. Putting this all together, fast, into digital products for different farm sectors is out at the cutting-edge but will help change the way farmers think about their land. In a first for Australian conditions, one of our postdoctoral fellows, Dr Joel Dabrowski, is applying machine learning to help the prawn farming industry. Prawn ponds are complex environments and farmers need good water quality to produce healthy, fast-growing, high-quality prawns. Sensors that measure water quality are expensive and can generate a large volume of data that can be difficult to manage and interpret. Dr Dabrowski is looking at how machine learning can predict when conditions might be detrimental to prawns health and productivity, such as a crash in dissolved oxygen. Machine learning is where computers can ‘learn’ and improve at something using data, without being explicitly programmed. The team are also looking into other technologies not traditionally used in farming at all, such as augmented reality from the gaming world. This could inform the development of technology to alert farmers if detrimental conditions are approaching so they can deal with it before it’s too late. Can you imagine carbon markets not only supporting Australia in addressing climate change but also boosting livelihoods and leading to great environmental outcomes? Australia’s carbon markets could help farmers achieve best management practices, steward the land and supplement farm incomes. Individually, Australia’s 140,000 farmers are small but collectively results could be large. A typical farming enterprise has opportunities to manage or increase vegetation, boost soil carbon, avoid methane and nitrogen emissions, and improve energy efficiency. Together, these farm carbon opportunities have huge abatement potential for Australia. Helping build a digital carbon marketplace is an example of the work Digiscape is tackling in a way that no-one else in the world is. In an Australian first, our discovery tool will help producers understand what options they have for participating in carbon markets and what those options mean in terms of income and greenhouse gas emissions generated or reduced. This would lead to carbon markets that support Australia in addressing climate change while also helping farmers create additional income streams and improve the sustainability of their farms. Robots, such as driverless tractors, will no doubt be a normal fixture in the farms of the not-too-distant future. But they won’t be replacing farmers because they’ll be needed to provide the instructions. Our research aims to help farmers make sense of and integrate the data that is increasingly becoming available on their farms so they can use it to design, implement and evaluate farming plans that improve their businesses. Science-based feedback on actions, or ‘experiments’, such as how much fertiliser, water or herbicide to apply on different areas of land will help give farmers confidence in their decision-making so that they can manage each paddock individually each year for maximum benefit. Our on-farm experimentation work could be used throughout the world’s varied production systems. Well done for this kind of article. There is no doubt that a revolution is underway. My concern is that we dont have enough of the kind of farm businesses to really apply this technology. I believe we need to give as much attention to business skills and business models as we do to technology. More networks, equity partnerships and cooperatives need to be considered. Big fan of your work in this field (no pun intended). I realise that this is going to be the future of farming. I wonder though if this will mean that smaller farms may be as viable or even more viable in the future hopefully halting the drain of population towards the cities. Or will the rise of much larger conglomerate style farming practices be best suited to uptaking these technologies meaning that the smaller country towns will become less viable over time due to shrinking population numbers.